Home » Farm Tech » modern agriculture » What challenges does indoor farming face today? 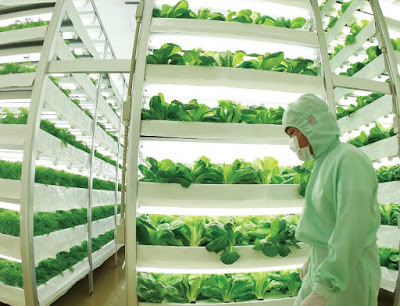 What challenges does indoor farming face today? Agrotechnomarket.com - As we know there are many benefits of indoor farming such as to improve food safety, reducing food waste, reducing water pollution and growing tastier and more nutritious food. In addition to, recently there have also been some impressive fundings for a player that establishes a giant 80,000 square foot vertical indoor farm from a converted steel factory in New Jersey. And it is AeroFarms, one of the indoor farming players, has raised $50 million from Goldman Sachs and Prudential. And Sundrop Farms, one of the greenhouse farming, has builded a 20 hectare self-sustaining greenhouse facility in South Australia, raised a whopping $100 million from private equity giant KKR. Vertical farmers and software startups to lighting specialists, greenhouse producers and university researchers revealed that there are some clear challenges ahead too. Here are three of challenges for indoor farming. A lot of the technologies being used in indoor farms and others, for the example of LED lighting, which is poised to dramatically impact the industry by providing optimum light spectra for plant growth. The large amounts of energy that LED, controlled environment agriculture co-director at Cornell University, revealed research pointing to a much higher carbon footprint for indoor ag, in both greenhouses and vertical farms, than outdoor farming, including the transportation costs and use of chemicals. While the examples above of AeroFarms and Sundrop Farms indicate that funding is available for indoor agriculture — and from big name investors at that — this is certainly not the whole picture. As with many agriculture-related investments, finding funding can be hard, and this can in part be put down to the challenge investors have in placing certain investments within their portfolio. With companies ranging from those selling the technology bought or used by indoor farms, to physical production assets, the investor audience could vary significantly. Limited funding also slows down the pace of the research for indoor farming happening at public institutions and universities, which in turn limits the availability of data and information for would-be growers of indoor farming. The need for more sharing and collaboration on data collection and research was a big theme of the event and discussions among delegates afterward. Hiring of indoor farming experts is a challenge, ensuring the right people are running indoor ag businesses is also of utmost importance as the industry scales. 0 Response to "What challenges does indoor farming face today?"